Image Size: 23" x 29"
The F-16 Falcon - America's ultimate single engine air-superiority fighter. Two birds brilliantly adapted o their elements, both a part of America's heritage and defense, converge in this work by artist Jody Sjogren. 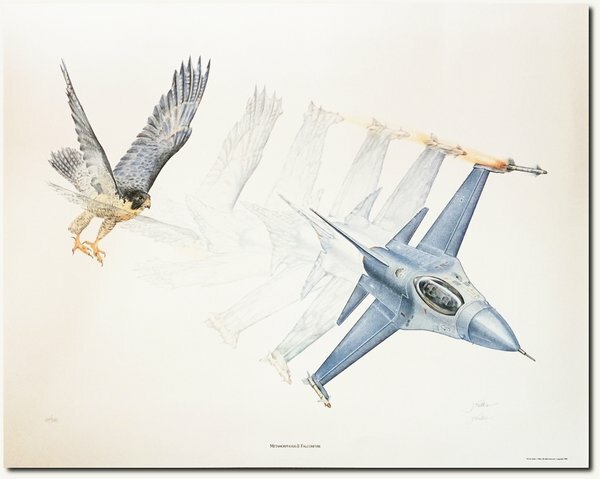 "Metamorphosis II: Falconfyre" is a vision of the power and majesty of the unrivaled bird of prey put here by our Creator, and its strategic counterpart engineered by human genius. The transformation is sublime - from the great winged predator into the most powerful guardian of freedom in the skies. Condition Note: This print was framed in conservation materials since purchased. It is in very good shape and the color seems to be very balanced as it was when new. Some very slight dimpling is on the paper but would not be noticeable when framed. A very good value on a long since SOLD OUT print. One of Jody's first prints (published in 1986) and still one of the most collectible. Comes with original Flyer as the COA.